Pershing Square is a one block district in central Los Santos, San Andreas, in Grand Theft Auto: San Andreas. Pershing Square consists of a park surrounded by the southern Commerce, with sculptures and a fountain in the middle. The headquarters of the Los Santos Police Department are located on the eastern side of the square. 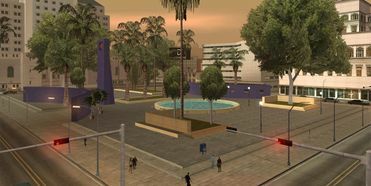 The Los Santos City Hall is also located on the southern side of the square. The square is based on the similarly named Pershing Square in Los Angeles. This page was last modified on 26 April 2012, at 20:35.